Yes, I have worked in a few drops of boiled linseed oil to rubber based inks to loosen them up when they start to thicken up.which should be lower in cost and more readily available. Use as little as possible and work it into the ink before adding to the ink plate, as it will take s long time to mix in on the press. There are thinning varnishes available, but they will be no more effective than the basic boiled linseed product, and most likely, more expensive. 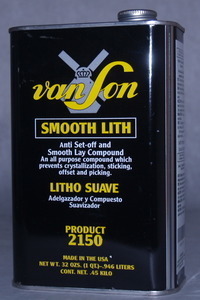 I have used Van Son Smooth-Lith for many years for correcting the ink problem that you have described. I am sure it is available in Europe and everywhere. Van Son is based in the Netherlands (thus in Europe) and when you check out their website, you’ll find everything that you might need. I’m certain that they have got representatives in the Czech republic as well. And, if not there, in Germany. Many many thanks to everybody for your posts! We bought linseed oil today and we will see how it goes. However, we´ll have a look for the original Van Son additives just to be 100% sure and have it handy.